Campaign claims spousal privilege, says "role has not been inappropriate"
ANCHORAGE, Alaska (CNN) -- He's the man Alaska Gov. Sarah Palin affectionately calls her "first dude." Todd Palin, who grew up in Alaska, is a former oilfield worker and world-record holding snowmobile racer. Todd Palin was introduced to the nation at the Republican National Convention as a blue-collar oil worker, a laid-back father of five and a world-record-holding snowmobile racer. Todd and Sarah met in high school at a basketball game and eloped in 1988, six years after graduation. Todd grew up in Alaska and is part Eskimo. He's an avid outdoorsman and champion of the Iron Dog snowmobile race. He's worked in Alaska's oil industry and as a fisherman. But in recent times, he's had another role. Some call him the "Shadow Governor." In government circles and among the family's acquaintances, Todd Palin is known as his wife's greatest adviser and most loyal protector. One family friend said, "Todd is incredibly supportive and is willing to do whatever it takes to help Sarah." Todd may appear quiet, almost shy, but he's made quite an impression on his wife's running mate, Sen. John McCain. On the campaign trail this month in Lancaster, Pennsylvania, McCain said, "He's not afraid of Washington, D.C.! He can take them on!" Alaskans interviewed by CNN say Todd Palin has plenty of influence. He's not on the state payroll, but lawmakers say he is a central figure in his wife's policy agenda. Stephen Branchflower is one man who certainly thinks so. Branchflower was hired by the Alaska Legislature to investigate Governor Palin's firing of the state's top cop - Walt Monegan - and whether the Palins pressured him to fire the governor's former brother-in-law, trooper Mike Wooten. Sarah Palin has said Wooten repeatedly threatened her family amid a bitter divorce from her sister. She claims that he even threatened to kill her father, an accusation that Wooten denies. Branchflower wants to subpoena Todd Palin because the governor's husband "has spoken to numerous government employees. ... He's such a central figure to the events." CNN has seen thousands of e-mails released this year from the governor's office that show that Todd Palin was copied on hundreds of them. The topics of the e-mails ranged from public criticism of Sarah Palin to her meetings with corporate leaders. Andrew Halcro, who ran as an independent against Sarah Palin for governor in 2006 and is a critic of the Palins, wants to know why Todd Palin was being copied on state correspondence. Halcro wrote a blog post about Todd Palin called "Shadow Governor" and says, "Todd plays the role as kind of the fixer." Even Halcro found himself the subject of e-mails that Todd Palin was copied on. He wants to know why. "This whole process, and the whole string of e-mails, to me really raise some red flags," Halcro said. But campaign spokeswoman Meg Stapleton explained, "There is spousal privilege in that the governor is asking him to print them off or take care of business." 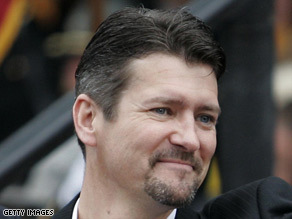 Alaska lawmakers say Todd Palin is a fixture at the state Legislature. So much so, some say they've joked about getting buttons that read, "What would Todd do?" One of those lawmakers is Lyda Green, a Republican and state Senate president who is not friends with the Palins. "I had a meeting I requested with the governor. ... I was particularly surprised that Todd was there. I had never seen a spouse stay in the room through the meeting." The campaign said, "Todd's role has not been inappropriate." The campaign also confirms that Todd Palin has taken two trips with state commissioners to survey Alaskan mines and one to survey part of the proposed route for a natural gas pipeline, his wife's top goal. The state paid for those trips, according to the campaign, because they were considered "state business" since Todd Palin is trying to expand Alaska's work force. Now he's spending plenty of time out of state -- at his wife's side -- as she criss-crosses the country. A far cry from juggling the cooking and carpooling for their five children.